Nancy and Jake Jensen of Missoula, Montana, adopted their son, Jesse, 17 years ago. He was a healthy, bright-eyed 5-year-old who brought new life to their family. Two years later, Jesse came down with what they thought was "an incredible case of the hiccups that would not stop," Jake Jensen recently told KARE 11 News. The hiccups continued for two long weeks, until a doctor determined the surprising cause. Jesse, the doctor said, had Tourette syndrome. For the next 10 years, Jesse's involuntary vocalizations and tics--hallmarks of the condition--went from bad to worse. They included a neck tic so severe the family feared Jesse would break his neck. And that wasn't all. "I couldn't do all of the things a normal teen could do, so it was definitely hard," Jesse tells KARE 11. Finally, in August 2009, Jesse had enough. "Jesse came into my office and began to just sob because of the pain he was experiencing as a result of his neck tic," Jake Jensen says in a video the family made about Jesse's struggle with Tourette's. "He was in incredible pain, and he just said to us, 'I want that surgery.'" "That surgery" was deep brain stimulation surgery, which the family had learned was being studied at Mayo Clinic's Rochester campus as a treatment for Tourette syndrome and other conditions. So Nancy Jensen called Mayo, and found her way to neurosurgeon Kendall Lee, M.D., Ph.D., who agreed to meet with Jesse. Leading up to his surgery, Jesse was "very positive, very enthusiastic, very determined, very set in his mind," according to his dad, although his anxiety increased on the day of the surgery. "He was great up until he had to put the hospital gown on," Jake Jensen says. As the surgical team began to wheel Jesse into pre-op, he looked back at his dad and asked him one question. "He looked toward me and said, 'Am I still your hero?'" Jake says. "And … of course I responded, 'Yes.'" 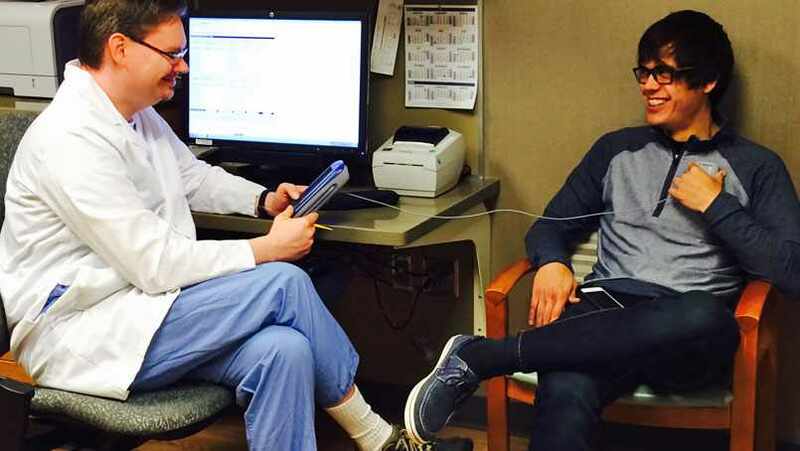 It's now been a few years since Jesse's surgery, and his family says he's essentially "tic free," thanks to the heroics of his Mayo Clinic team and the generosity of Medtronic, which donated the device that Dr. Lee and his team implanted. And, scary as it may have been, Jesse tells KARE-11 the surgery has been worth it. So Jesse is sharing his experience, and Nancy Jensen has co-authored a book about the family's experiences, to provide hope to others, they say. You can read and watch more of Jesse's story here and here. Then, be sure to find us here, on the In the Loop blog, where you can share your comments and share this story with others.